Here's the thing about working at a paper with two food critics: We don't always agree. 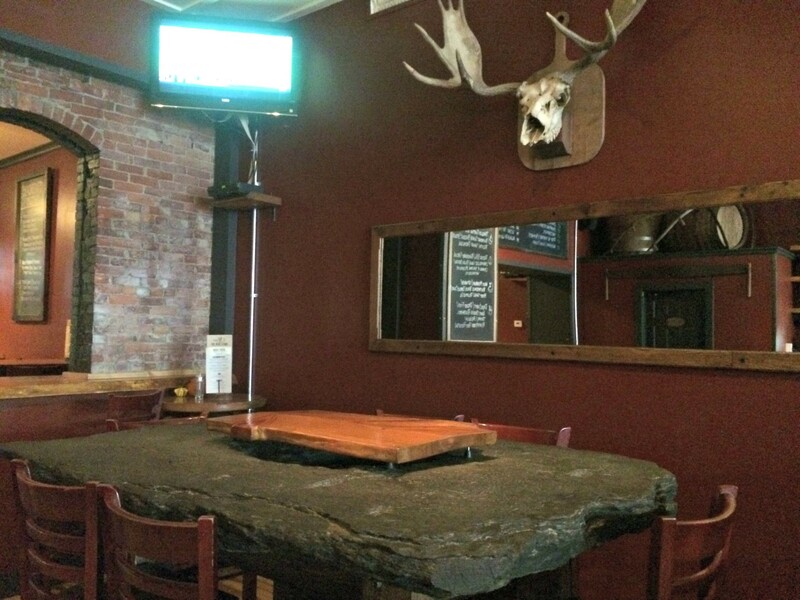 When my former colleague Corin Hirsch reviewed the Blue Stone in Waterbury back in January 2013, she wasn't a huge fan. Though I hadn't tried it, I just had a feeling I would like it more than she did. Frequent recommendations from friends I trust only bolstered that instinct. It wasn't easy to add something to my rotation of Waterbury favorites Prohibition Pig and the Reservoir Restaurant & Tap Room. But I finally made the trip specifically for pizza on Sunday. The Blue Stone space, with its embossed ceilings, brick archway and moose skull, is endearingly manly. The main attraction, though, is the "blue stone" itself, a chunky well stone that once resided in an 18th-century farmhouse in Pittsford. With only a few other customers at Sunday lunch, I felt like I was dining in a private gentlemen's club, part restaurant, part museum. 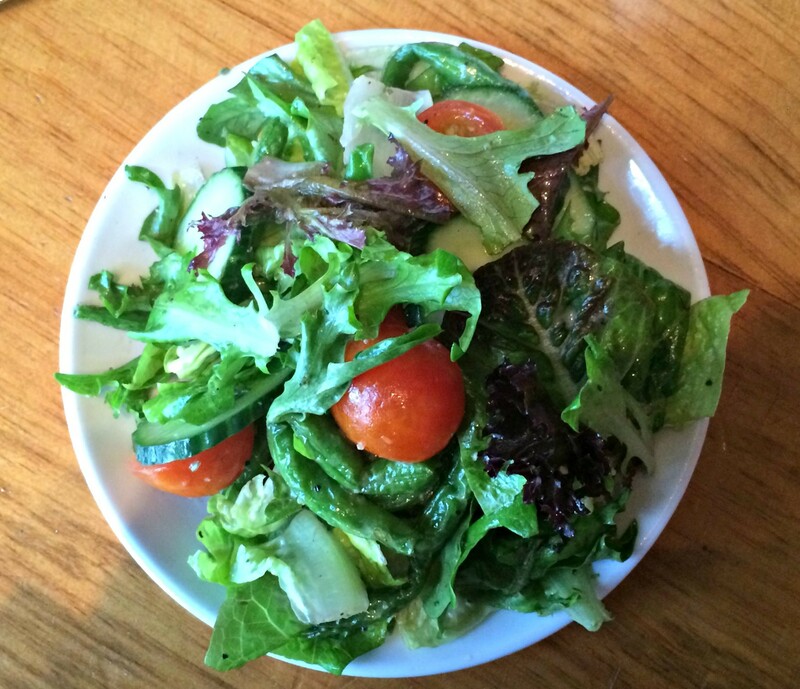 A chef friend had been especially outspoken about her affection for Blue Stone's salads. I ordered a small Stone Salad, a simple pile of field greens mixed with cucumber slices, cooked green beans and cherry tomato halves. My dining partner said the tomatoes were the worst he's ever tasted. But it kind of didn't matter, because the maple-sage vinaigrette could make anything taste good. Seriously. I'm opposed to bottled dressings, but I would buy a bottle of this lightly sweet, herbaceous stuff. One of the Blue Stone's attractions for me was the Woodchuck. 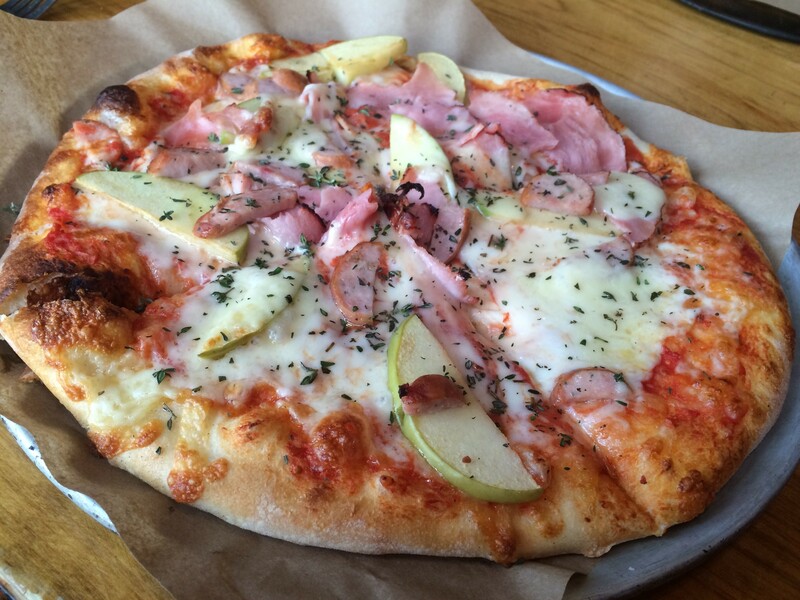 A pie topped with smoky ham, chicken-apple sausage, apples, cheddar and thyme sounded made for me. The toppings hung together as satisfyingly as I had imagined (how can you go wrong with such a classic Vermont combo?). The toppings were placed so that one quadrant of the pie was nearly naked, but a little rearranging did the trick. The crust was puffier than I'd expected, and a little too doughy for my taste — kind of like the rough-hewn dough mom might make. However, the pudgy dough didn't bother me as much on the special pizza I tried, perhaps because a tangy goat cheese Béchamel replaced tomato sauce. The pie tasted more like a unique savory pastry than ordinary pizza. A word on goat cheese: Its ubiquity on 1990s menus seems to have discouraged some of today's chefs from taking advantage of its diverse flavors. But, along with pesto, it was popular for a reason: It's good. If people don't want to eat a food because they consider it "dated," well, it will leave more for the rest of us to enjoy. 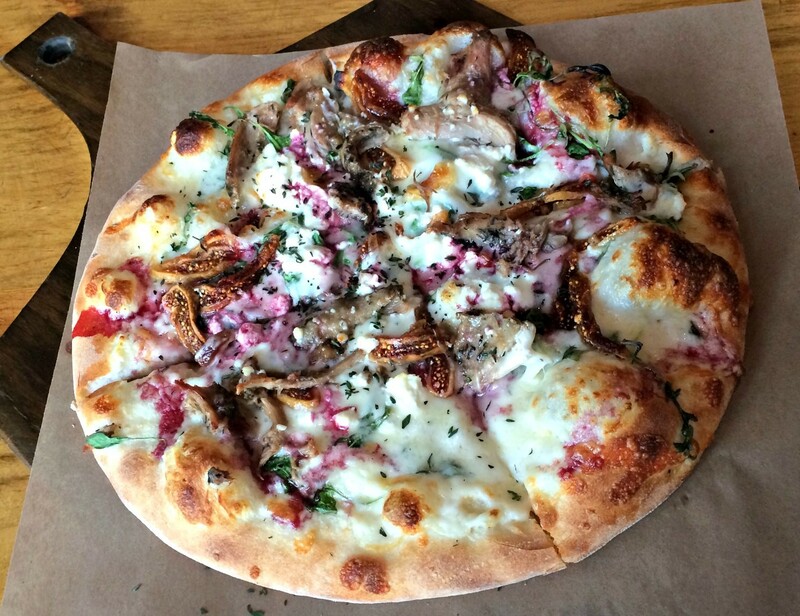 Along with the Béchamel, the pizza was covered in chubby chunks of duck confit, sweet dried figs, thyme and arugula. A sweet-and-sour blackberry-Port reduction was drizzled lightly over the pastry. I wish there had been even more to brighten up the pie as a whole. But, dang, I hope this becomes a menu staple. When we ordered the pumpkin tiramisu for dessert, our very helpful server warned us that it wasn't really tiramisu. She was right. 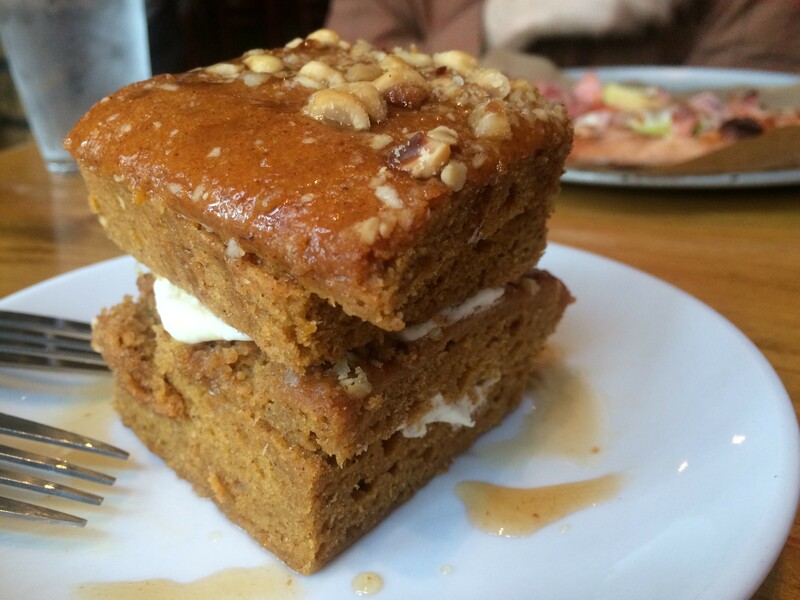 I'm not sure why the chewy pile of pumpkin bread was labeled as such in the first place, but that didn't diminish my enjoyment of it. The not-too-sweet, spiced cake was cut in three layers and put back together with mascarpone in between. On top was an unexpected but welcome scattering of toasty hazelnuts. A drizzle of sharp cider reduction lent a puckery note, much in the same way that the blackberry-Port woke up the duck confit pizza. Despite a few minor complaints, I'm adding the Blue Stone to my Waterbury dining rotation. I go to Pro Pig for a dose of indulgent Southern soul, and the Rez for comfort food. What I found at the Blue Stone was balance. Each dish hit spots of salty, savory, sweet and sour, and that left me satisfied.